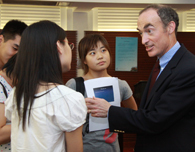 William Buzbee at the University of International Business and Economics Law School in Beijing, China. The environmental crisis that is the Gulf Coast oil spill has captured attention as far as China. Law Professor William Buzbee recently returned from there, where he met with scholars and environmental specialists. The purpose of the trip was to get a better understanding of how environmental law is enforced in China and share how it works in the U.S., says Buzbee, director of Emory's Environmental and Natural Resources Law Program. "The BP oil spill is a prominent news story in China," he says. "My sense is that because America presents itself as environmentally good, the Chinese are really just trying to understand how something like this could have happened here." The answer? Sloppiness, says Buzbee. "Those responsible for what has become a crisis of massive proportions are now trying to put a Band-Aid on a massive wound," he says, "which was the result of private sector error and regulator coziness with the oil industry, as well as not enough close investigation and anticipation of the environmental risks." Emory University experts in law, politics, science, health and business are available to provide perspective and long-term insight into the crisis. CNN and other national and local news outlets have sought comments from Buzbee, an expert on environmental, administrative and other public law issues. What will be the outcome? Lawsuits on top of governmental and private cleanup efforts and legal reform, says Buzbee. Maybe even criminal charges from the federal government. "Years of legal skirmishing are inevitable," he says. "Fishing, tourism - layers upon layers of business will suffer; even businesses here in Atlanta. In addition to the obvious catastrophic environmental costs, there will be rippling economic effects as people avoid the area for months, even years to come." He participated in a series of meetings and conversations with individuals familiar with environmental law policies and enforcement in China, from members of the Natural Resources Defense Council to environmental law practitioners, a governmental prosecutor and scholars. Strengthening Emory's links to top universities and scholars in China was a broader goal of the trip, organized with the Halle Institute's assistance. Buzbee also gave a lecture at a Beijing law school. Questions, he says, ranged from concerns about climate change law and politics, to who was to blame for the Gulf oil spill and who would address it. CNN International | Would Federal Intervention in Oil Disaster Make U.S. Liable?